Leaf Defier is the best product available to eliminate the need to ever have your gutters cleaned again. 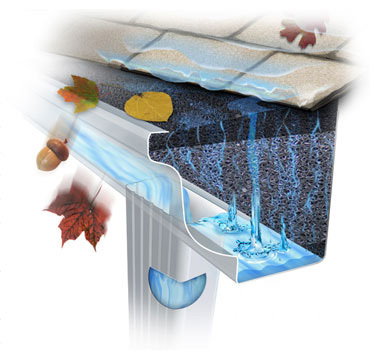 Leaf Defier is an open cell polyurethane insert that is cut and shaped to fit firmly in your gutter. The Leaf Defier material is factory treated with biocide and fungicide to prevent the growth of mold, mildew, fungus, algae, and moss. This material also has a UV stabilizer built in to prevent fading from the sun. Leaf Defier will hold up against the toughest of storms, hardest rains, snow, ice and anything that it may come in contact with. Clogged gutters can cause water damage, foundation problems, basement leaks, rotting fascia boards and soffits, mold and mildew, and most importantly, insect infestations and harborage areas. Leaf Defier is virtually invisible once installed, will not interfere with the beauty of your home, and comes with a 25 year no clog warranty leaving your gutters free flowing for a guaranteed 25 years. Please call Infestation Control, Inc. for a Leaf Defier installation estimate.